Texas Waste Co. is the premier porta potty and hand wash station rental service in Alvin, Texas. Founded in 1999, we distribute to construction sites, businesses and events in or near Alvin and can accommodate for same day transport. At Texas Waste Co. we don’t just distribute to the Alvin, Texas community, we’re a part of it. From owning and renting portable toilets to cleaning and delivering; we run a business that earns, spends and hires local. Whether it’s brown cows at SNO Country, brisket at Joe’s or enchiladas at Delia’s, we are committed to our community and appreciate the support we’ve received. Contact us the next time you need a portable toilet, restroom trailer or hand wash station in or near Alvin, Texas. Our supply is always in stock and ready for immediate rental. Texas Waste Co. provides simple ‘all in’ or ‘drive out’ pricing so that you know what you’re paying for. And because we own, service and clean our portable stations in-house, we are often sought after by porta potty brokers who are looking for a reliable supplier near Alvin. From construction sites and businesses to special events, you can depend on us for your portable toilet and sanitary station requirements. At Texas Waste Co. We’re accountable; we’re local and we stand by our service. Bull ranchers first inhabited Alvin, Texas in the 1800’s. It was the expansion of the Santa Fe Railroad that brought settlers to what would later become known as Morgan’. Dubbed after the community’s first resident, Alvin Morgan, the city was incorporated in 1893, making it the oldest incorporated settlement in Brazoria County, Texas. 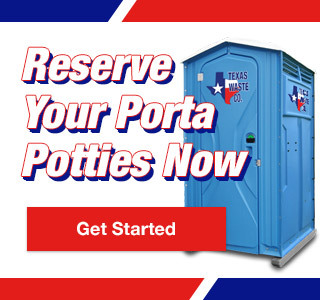 Alvin – Porta Potty Rentals Available Now!